Inspired by the Fender Contemporary series of the 1980s, today's Squier Contemporary Stratocaster HH proves that a rocker-ready superstrat can be had for not a lot of dough. Twin high-gain ceramic humbuckers dispense unrelenting good vibes upon your listeners, from throwback SoCal crunch to contemporary forms of rock, punk, metal, and shred. The Slim "C" neck with 12" radiused fingerboard provides a comfortable transition to higher frets and plenty of room for chording and bending. Meanwhile, the eye-catching zebra humbucker, trem bridge, and matching painted headstock give the Squier Contemporary Strat HH the right look for your brand of hard rock and high-energy music. The Squier Contemporary Strat HH has you covered for all flavors of high-gain goodness, from singing leads and screaming solos to aggressive amp crunch. Onboard tremolo readies the Contemporary Strat HH to add texture to chords and movement to solos straight away â€” no mods required. 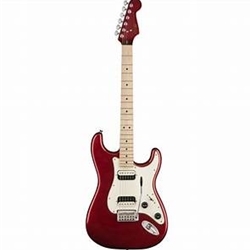 Lead players will enjoy exploring the Contemporary Strat HH's quick, comfortable maple neck, whose 12" radiused fingerboard flattens out toward the body to facilitate faster playing styles. Jumbo frets make bends and vibratos a cinch, too. If you're looking for a great-playing axe with inspiring stock tones to match, check out the Squier Contemporary Strat HH. Hours: Mon-Fri 10am - 7pm.